The time lapse animation above shows us the advance and retreat of continental glaciers during each ice age over several million years. We are currently in a period of massive glacial retreat, with most ice sheets and valley glaciers shrinking. What Happens when Glaciers Melt? Because glaciers expand outward from their cold center towards warmer areas, they always melt at their front edge. WHEN GLACIERS MELT THE ROCKS THAT WERE FROZEN INSIDE OF THEM ARE DEPOSITED ON THE GROUND. BECAUSE THEY JUST FALL OUT OF THE GLACIER AS IT MELTS, THE SEDIMENT DEPOSITED BY A GLACIERS IS UNSORTED AND UNLAYERED. The boulders, pebbles, sand, and silt that were in the glacier all get dumped in the same spot all mixed together. Notice that glacial deposition is UNSORTED. Not arranged by size in any way! 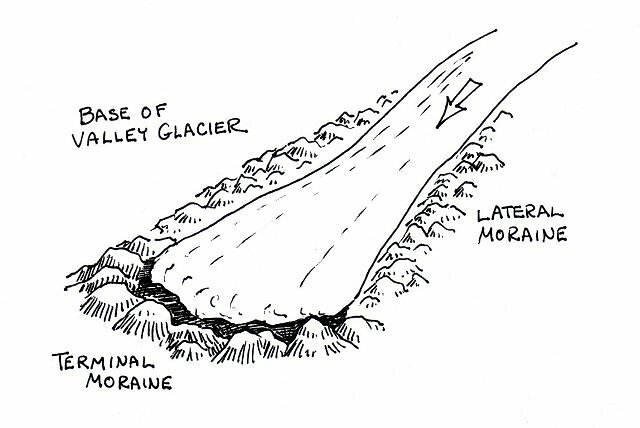 As glaciers melt and deposit sediment, they change the landscape and leave behind characteristic features that provide evidence that glaciers were in the area. A MORAINE IS A RIDGE THAT FORMS AT THE BOUNDARIES OF THE GLACIER. IT IS LONG HILL MADE FROM UNSORTED SEDIMENT THAT MARKS THE OUTLINE OF WHERE THE GLACIER WAS LONG AFTER IT MELTS. When the glacier retreats the lateral moraines are left behind marking the edges of where the glacier was. They mark the farthest point of glacial advance. Drumlins are important, because like striations, THEY INDICATE THE DIRECTION OF GLACIAL MOVEMENT. The thin pointy end of the drumlin points in the same direction that the glacier was flowing. ERRATICS ARE LARGE BOULDERS DEPOSITED BY GLACIERS. THEY USUALLY DO NOT MATCH THE SURROUNDING BEDROCK. They are strange looking, because they appear in places where it they don't belong, and they are not the same as the surrounding bedrock. 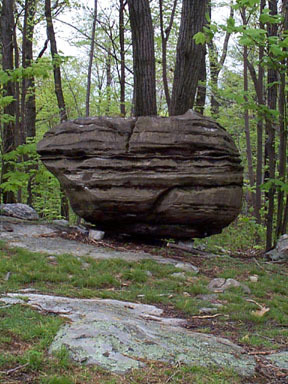 They often look like random boulders in the middle of a field or forest. As glaciers melt, the melt water pouring out of them typically forms into small streams. These small streams may carry out sediment that was held in the glacier. When these sediments get deposited by the stream they are sorted by size just like in any river. GLACIAL DEPOSITS THAT FORM FROM THESE STREAMS ARE CALLED OUTWASH. BECAUSE OUTWASH IS CARRIED IN RUNNING WATER IT IS SORTED BY SIZE. Outwash deposits also change the shape of the landscape around them by creating new glacial features, but these features are made of sediments that are sorted by size. ESKERS ARE LONG WINDING RIDGES THAT FORM FROM GLACIAL OUTWASH. They mark the path of streams leading away from melting glaciers. They have a very unique snake-like appearance. 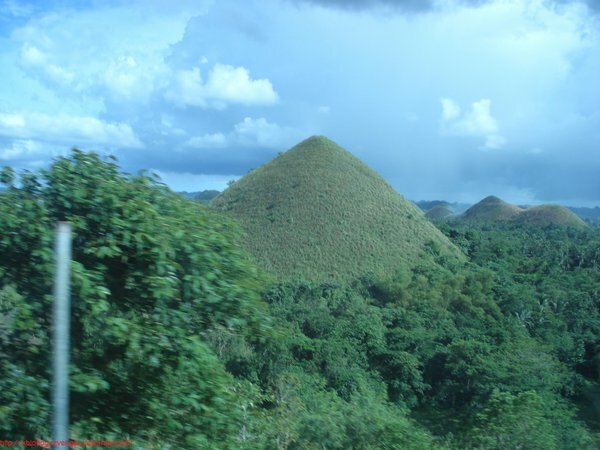 KAMES ARE SMALL CONE SHAPED HILLS MADE FROM GLACIAL OUTWASH. They form when streams form on top of the glacier, and the sediments get deposited into the cracks in the glacier. KETTLES ARE DEEP DEPRESSIONS THAT FORM WHEN A CHUNK OF GLACIAL ICE IS BURIED, THEN MELTS. 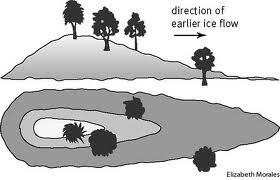 When the buried ice melts it creates a big deep hollow or bowl carved out of the landscape. SOMETIMES THE WATER FROM THE MELTED ICE DOES NOT DRAIN, BUT INSTEAD FILLS THE KETTLE CREATING A KETTLE LAKE. Many lakes are formed by glaciers in other ways. Sometimes meltwater from the glacier is damed by moraines creating a moraine lake. Other times, the glaciers carve a depression in the ground deep enough that it fills with groundwater. 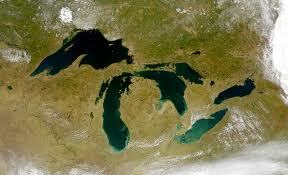 Important examples of lakes created by glaciers include the Finger Lakes in New York State, and the Great Lakes.